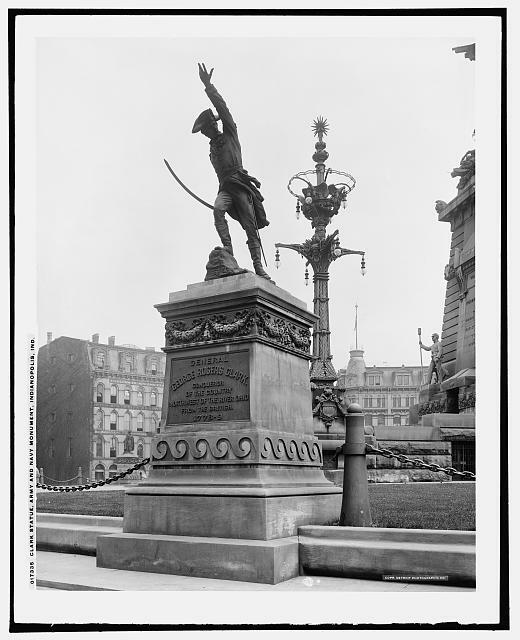 George Rogers Clark was an American colonel in the American Revolution who captured a British fort to prevent the slaughter of colonists by the Indians. There appears to be a grammatical error on page 73, last sentence of the first full paragraph (although at the the time of the writing, the term “waked up” was more common). How would the phrase be said today to be considered correct? What functions did the drummer boy perform in the military? Draw an illustration of the little drummer boy being floated across the river on his drum. Map the trip George Rogers Clark and his men made from Kaskaskia, Illinois, to Vincennes, Indiana. List the various methods Clark used to keep his men’s spirits up. Guess who George Rogers Clark’s younger brother was. The Clark expedition is one of the most thrilling exploits in American History. Kaskaskia, Cahokia and Vincennes were captured and all the territory between the Ohio and upper Mississippi rivers was brought under the American Flag. At Vincennes, Clark took an important prisoner, General Hammilton, the British commander at Detroit. Hamilton was hated by the frontiersmen, who called him the “Ha’r-buyer” because he paid the Indians for the scalps that they took in raids on the settlements. Biography from the George Rogers Clark National Historic Park. British occupation and surrender explained at the National Park Service. Really a timeline of George Rogers Clark’s life at the Indiana Historical Bureau. Biography, and history of the march and subsequent surrender of the British at the fort from the National Park Service. 58-page download with historical information, photos, and maps from the National Park Service. Download from the Indiana Department of Natural Resources subtitled “Archeology of a Frontier Hero” describes efforts to learn more about the times in which he lived and his activities through archeology. Library of Congress photo from the statue in Indianapolis, Indiana. Part of the Young Patriots series derived from the Childhood of Famous Americans series. Chapter written by Theodore Roosevelt from Hero Tales from American History. 16-page download from the Indiana Historical Bureau includes background information, timeline, and several excellent maps for notebook. Teacher guide at Patria Press that goes along with the book above. EduPlace.com map for locating Kentucky, Indiana, and Illinois. Map for notebook, helpful for locating the Ohio River. Map for notebook, helpful for locating Vincennes and the Wabash River. Map for notebook, helpful for locating the Kaskaskia and the Kaskaskia River.